Hanjoo studied in our TOEFL preparation course. Hello, I am Hanjoo Bae and many friends know me as Andy. I have been here for six months during this time. I have had experienced not only such cultural activities, but also a great educational improvement. At first time, I was in low intermediate. It was very lucky for me, given the fact that I met nice friends and teachers. The teachers of that class were Nick and Jonathan, who were my first teachers at EC New York. They were very nice and always encouraged us to build up our English skills and confidence. Few weeks later, I moved up to High Intermediate class, the level was two levels higher than the previous one. There was a teacher, his name was Drew and his class was so academic that I improved my English skills again with him. I like that kind of class. Anyway, I moved up again to Upper Intermediate class and changed my course to TOEFL. 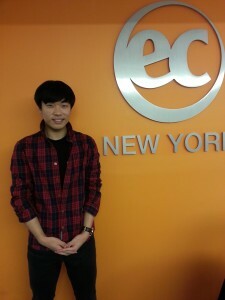 The time that I was in TOEFL class was about half of my EC life. What I liked the most about TOEFL class were the teachers. Tatiana, Jesse, and Brett, they were so enthusiastic and humorous that I was able to concentrate on my studies and be entertained at the same time. Among them, it is no stretch to think that Tatiana was my best teacher, since she contributed to my improvement in TOEFL speaking which happened to be my weakest part. She was also my tutor who mentally supported me as well. For these reasons, I don’t regret choosing ECNY as my English Institute and I will never forget these fragrant memories.